In 2012, the Italian courts handed down a decision that you could say sent shockwaves across the world. Seven Italian scientists were sentenced to six years in prison. Their crime? Failing to warn the public about earthquake risks right before a magnitude 6.3 quake killed 309 people. Today, six of those convictions were overturned. 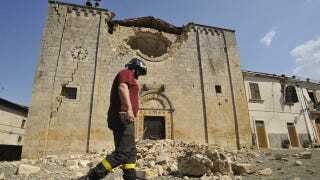 The seven scientists were all members of a government commission that met to discuss the risk of earthquakes near L'Aquila, Italy back in 2009. They tried reassure residents, who were on edge because of shaken frequent tremors in the area, but the reassurances only backfired when the big one hit a few days later. An appeals court acquitted six of the seven scientists of the manslaughter charges; they're now free to go unless the convictions are reinstated by a higher court. The seventh, Bernardo De Bernardinis, former deputy head of Italy's Civil Protection Department, was sentenced to two years in prison, also pending an appeal. De Bernardinis was singled out because of comments he made to the press about how frequent tremors dissipating energy were a good sign, a discredited idea among seismologists.